This hilarious adventure gives your children the tools to face pesky word problems with confidence. Note: This complete set is for grades 6 and up. The DVD by itself is for grades 4 and up. Crack the code of word problems. Justin is back to show you how! The MathTacular4 DVD will automatically stop after our heroes introduce each new word problem (unless you set it to play straight through). You also get access to the videos online! With the workbook in hand, your kids can solve the puzzle right then and there. With the push of a button, your children can restart the DVD and watch Justin Time and Amber Waves carefully work through the solution. Your children can solidify each new concept with 5 extra practice problems. Mathematical skills used in the word problems start with simple addition and work up to ratios, fractions and algebra. 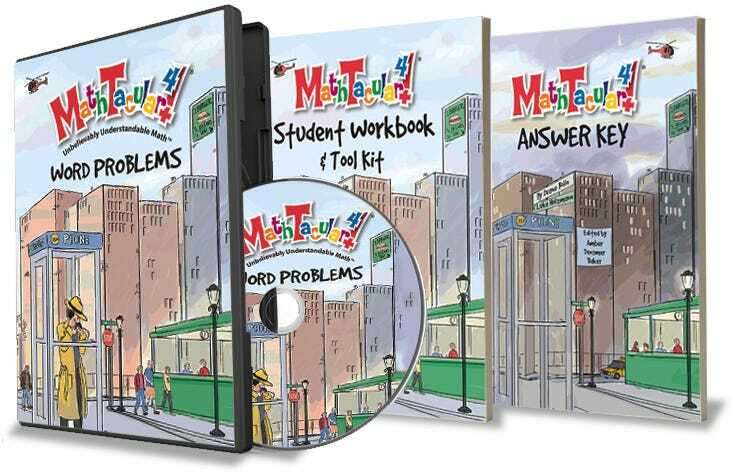 This set with the DVD, Workbook with Tool Kit, and Answer Key is great for grades 6 and up. (The DVD alone is great for grades 4 and up.) Also comes with digital access. Use this workbook to join Detective Justin Time and Amber Waves on their MathTacular4 sleuthing adventure. The complete companion to the MathTacular4 Workbook.